Did you know that you have electric rate options in Columbus? With our optional residential “Time-of-Day Pricing” plan, you can lower your bill by using electricity wisely and at the right time. How Does Time-of-Day Pricing Work? Columbus Water & Light pays less for electricity during nights, weekends, and holidays; we pay more during weekdays. The standard residential rate charges the same amount for electricity regardless of when it is used. 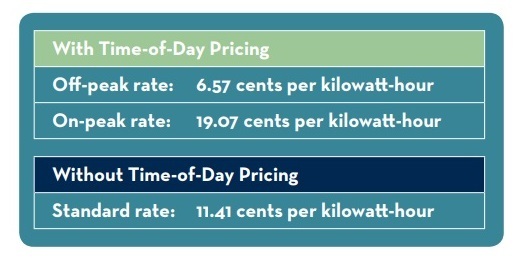 Optional Time-of-Day Pricing passes lower costs on to you when electricity is less expensive, and charges a premium when electricity is more expensive. What is Off-Peak and On-Peak? On-Peak refers to periods when electricity is the most expensive. Off-Peak is when electricity is the least expensive. Weekdays are on-peak, while nights, early mornings, weekends, and holidays are off-peak. With Time-of-Day Pricing, you can choose from three optional off-peak time periods, depending on your schedule. Will Time-of-Day Pricing Save Me Money? It depends! Call our office today. We can provide a free assessment help you determine whether Time-of-Day pricing could save you money. We can be reached Monday – Thursday, 7:00 am – 4:30 pm, Friday, 7:00 am - 4:00 pm at 920-623-5912. There is no cost to sign up, however you will be required to stay on Time-of-Day rate for 12 consecutive months before returning to the standard residential rate. For more information and to sign up complete the application and return to our utility office today!